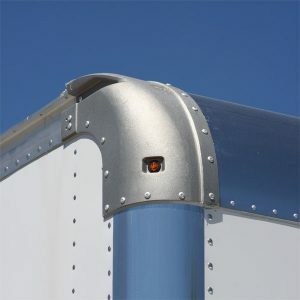 A rivet is a metal fastener that holds sheets of metal on a box truck together. 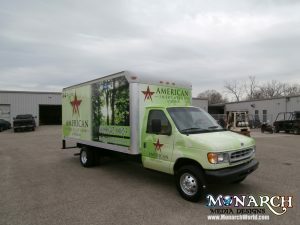 It is so important to consider the amount and size of rivets when deciding on materials for your box truck wrap. Almost all box trucks have at least some rivets. Wrapping them does not have to be a problem, though. 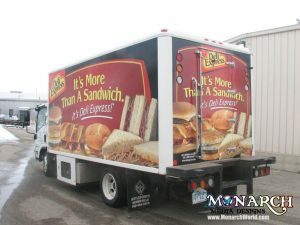 At Monarch, we always recommend that you use our Premium 3M Wrap material for any box truck with rivets present. We use the right materials and tools, and we have the skill sets needed to get the job done right. The risk of failure and bubbling is very high when economy or calendared vinyl is used or when the installer skips steps needed to wrap the rivets correctly. Box Trucks are Flat, Right? 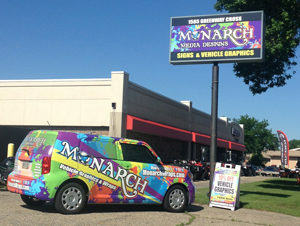 We have seen a lot of wrap companies using calendared vinyl instead of Premium Wrap Vinyl just to save money. They tell you the box truck is flat, so you can do it “the cheap way”. 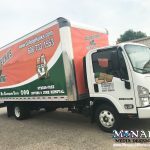 If your truck is truly flat with no rivets, the intermediate-grade, calendared vinyl is perfect. It works great on flat surfaces and is less expensive than wrap vinyl. The fact is…most box trucks are not “flat”. Those rivets, the tiny little game-changers, are holding the panels together. Some trucks can have many, and they can come in different sizes. Due to those naughty little rivets, we don’t recommend using the same calendared materials use for flat applications in sign-making. 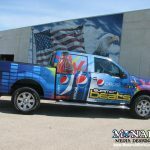 When wrapping a vehicle with rivets of any shape or size, it’s important to use Premium Cast Wrap Vinyl. Calendared vinyl is not going to conform to the rivets for long-term application. Trying to conform the calendared vinyl over the rivets is only going to cause stress because the vinyl wants to be flat, and the adhesive wants to stick to the vehicle. The stress that results causes the vinyl to break down quicker, and it starts to release from the vehicle. It will start to form “tents” around the rivets on the box truck. These tents end up causing the vinyl to fail as it gets brittle and causes cracks and tears. Our Premium Cast Wrap Vinyl loves shapes and curves. This is always going to be the best for rivets, because the cast vinyl conforms to the rivets’ shape. 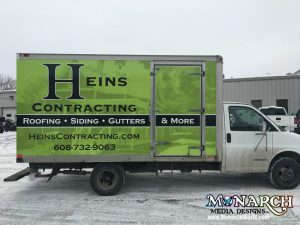 Cast vinyl will not only create a more durable surface with improved longevity, it will result in a cleaner and sharper look to your box truck wrap. 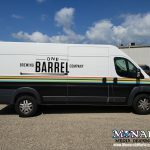 Premium Cast vinyl is going to be a bit more expensive, but it’s definitely worth it in the long-term if you are investing in a vehicle wrap. 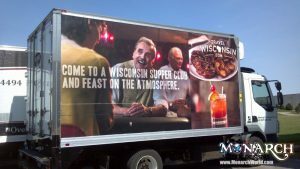 If your wrap is promotional and you are only intending to use it for short-term, we have a short-term removable transit wrap material. If you want to cover existing graphics temporarily without harming the graphics underneath. 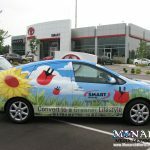 It’s smart to eliminate costs of premium materials if the wrap will be up for a short period of time. So, how do we make sure those rivets are wrapped right? Well, in addition to making sure we have the right materials, we also use specific steps after the wrap has been installed. Once the vinyl has cooled down after an installation, we re-apply heat to areas with curves, angles, and obstructions such as rivets. This is called post-heating. We want to enhance the memory of the vinyl, and that will in turn help it keep it’s shape for a longer time. This can prevent tenting around the rivets and our installers help to strengthen the memory of the vinyl. We’ll Wrap Those Rivets Right! The Monarch team takes the steps necessary to make sure your rivets look perfect. Those little rivets can cause big problems if not handled correctly! Check out more of our posts in our blog! 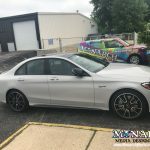 Learn why vehicle material is important, the top 6 things to know about your wrap company, and the top things to know about your vehicle wrap.